May 2012 update: You'll find the chive and sharp cheddar version of this recipe here. Did I ever mention how much I love scones? No? Huh. Well, I do. Absolutely adore them. Could probably eat them every day for a month and never tire of them. I even have a whole stack of delectable sounding scone recipes to try someday. In the meantime, I make my tried and true favorites. I already shared one of them with you last month, Cranberry Christmas Scones, which are tasty any time of year. 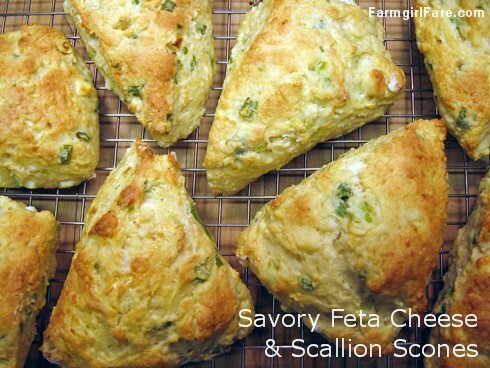 Another recipe I've been loving and making for years is for Savory Cheese and Scallion Scones. These were created back in 1993 during a severe scone craving when there was no butter in the house. They mix up quickly and are nicely versatile. Half & half will give you richer scones with a slightly nicer texture, but whole milk works fine, is lower in fat and calories, and is usually always in the fridge. Either way, these are very moist and are healthier for you than traditional scones made with butter and heavy cream. You can also substitute Neufchatel cheese for the cream cheese, but I don't recommend using fat-free cream cheese. Fresh baking powder is essential. And as always, I urge you to seek out local and organic ingredients whenever you can. These days they're often easy to find and, in my opinion, really do taste better—not to mention how much better they are for farm workers and the environment. Serve these scones warm from the oven with dinner instead of rolls or bread—plain, buttered, or with cream cheese. Or split and toast them in the toaster, spread with cream cheese and thinly sliced ham or turkey for a satisfying breakfast on the run, light lunch, or terrific after-school snack. They also freeze beautifully if you happen to have any left over (hint: the recipe can easily be doubled). Defrost them at room temperature and heat at 375° for about 5 to 8 minutes. If you're in a hurry, you can defrost them gently in the microwave and then put them in the oven or toaster oven. The optional egg glaze gives these scones a beautiful shine and dark golden color. Look for farm fresh eggs at your farmers' market or natural foods store, or search for a local farmer on Local Harvest. You won't believe the difference compared to commercial eggs laid by unhappy hens living in horrible battery cages. The yolks are sometimes so dark they're a gorgeous deep orange, and the eggs actually taste like eggs! And of course, you're also supporting small farmers. Not a feta fan? Try cheddar and chive instead, with or without a sprinkling of dill. You'll find more about growing your own chives (it's easy! ), along with a recipe for homemade herbed yogurt cheese here. I highly recommend investing in a couple of heavy duty commercial rimmed baking sheets. Treat them well—I usually line mine with sheets of unbleached parchment paper, which is wonderful stuff—and they'll last for ages. I've been using the heck out of some of mine for 20 years for everything from baking cookies to roasting Brussels sprouts. 3. Add the cheeses & toss gently with a fork until combined. 4. Add the scallions & toss gently with a fork until combined. 5. Beat the milk (or half and half) with the egg and gently it fold into the dry ingredients, mixing lightly until a soft dough forms. Add up to 1/2 cup additional flour if the dough is too sticky. 6. On a floured surface, gently pat the dough into a circle approximately 1-inch thick (or into two smaller circles for 12 scones). The key to tender scones is to handle the dough as little as possible and with a light touch. With a sharp knife (I use a large serrated knife dipped in flour), cut the circle(s) into 8 or 12 wedges and place them on a heavy duty baking sheet lined with unbleached parchment paper. 7. Brush the tops and sides of the scones with the egg glaze if desired, and bake for 20 to 25 minutes, or until golden brown. Cool on a wire rack. Serve warm, or cool completely and refrigerate or freeze in a heavy zipper bag or airtight container. 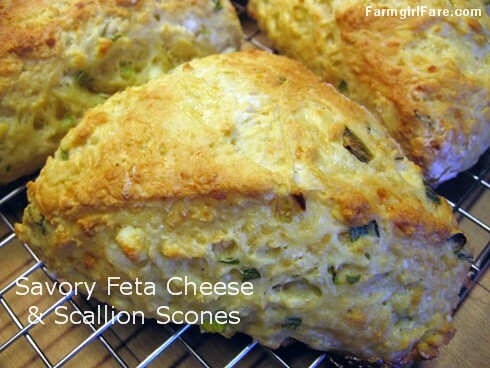 © FarmgirlFare.com, the sconehead foodie farm blog where Farmgirl Susan shares stories & photos of her crazy country life on 240 remote Missouri acres—and you can always find a scone or two in the freezer. Yum! Great pictures of the scones. I will add these to my list of recipes I have to try. Oooooooo, those look good! Nice to have some savoury recipes for scones..thanks! Are they still hot? I'm comin' over! I'll follow the aroma all the way to the farm! PS Put the coffee on, okay? After having read only the title of this post, I am in heaven. Scones - love 'em. Cheese and scallions together - love'em, love 'em. Lest any of you doubt that these scones are not simply the best scones ever, I will testify under oath that they are indeed the Best scones you will ever taste! An old friend who has eaten his weight in these scones. I just made these scones last night and they're very yummy. I'm having one toasted as breakfast this morning. Thank you for the recipe. Also, Susan, I love you website, I visit it every day to look at the daily pictures. I am very jealous of your farm life:). I have a variation with chives and no feta. It's still made with cream cheese, but you can't really taste it. Or at least, I can't. Let me know if you'd like the recipe. I can't believe it. You, the Dutch Queen of Baking cannot make scones? Surely you jest. Scone dough in your hair does indeed sound like you are doing something wrong, though. As soon as David L. arranges that house swap where I move to Paris, I'll take a long weekend and come over and bake scones with you. In the meantime, try these. They are super simple. And they'd go great with that pea soup. Let's just say I ate two while they were still warm. Welcome to the farm! I'm so glad you are enjoying the scones. Thanks for your kind words and for taking the time to write. I look forward to hearing from you again. Oh, yum. I'd add some jalapeños to those puppies, too, but I'm a bit on the masochistic side. Glad to see you cooking again, dear. Since yesterday I know: they don't only look tasty, they are delicicious! It took me just a little time after lunch for preparation and baking, before we headed off for a two hour walk in bright sunny (though cold) weather. When we came back they were just perfect! Thanks for this nice recipe, it will get the honour of being copied to my kitchen notebook! Oooh, yes please. I can just smell these. They look great! I just made these last night and they are soooo good. I couldn't stop eating them last night and then I had one for breakfast this morning. Yum! You'll have to try baking some. So easy! Thanks for taking the time to write. I look forward to hearing from you again. I tried these scones this weekend and they were a huge hit at a luncheon I had for some girlfriends. I'm goning to feature your recipe on my blog...Home Cooking is What I Like. I didn't realize that Good Ole Cook was you. You're not a new visitor. : ) Great to hear from you, and congratulations on your new blog! I tried out scones for the first time using your recipe. They were DELICIOUS! I even used skim milk and they were still great. Ive linked ur recipe from my blog. I cant wait to try out more varieties. Your recipes and instructions are foolproof. I also really enjoy your links to organic products. And of course the photos! Just had to post a comment in response to baking soda! I learned (the hard way) some "scone secrets". Don't use bread or cake flour! Too much or too little gluten are both bad! Use a general purpose flour. Keep the dry ingredients, the butter, any cheese and the bowl in the freezer until you mix it. The colder it is, the less the butter melts onto the flour. Handle the dough as little as possible, just enough to mix. I can't tell you how many flour bricks I made! Don't give up. The (very similar) recipe that I have for fruit/spice scones has me freeze them at least two hours before baking. I make the scones for my coffeeshop for the week on Monday, so I'm wondering if these will work if frozen and then cooked? You have a wonderful site here and I'm glad you linked to localharvest.org. I'd never heard of it, but at the shop we are trying to be ever more local and organic, so it will be greatly helpful. Thanks! How interesting that your scone recipe calls for freezing them for two hours before baking. Do you have any idea what the chilling is supposed to do? I'm thinking they don't freeze solid in that time. I've never frozen unbaked scones, but I've been told that after forming basically any scones, you can freeze them until solid on a baking sheet, and then transfer them to a container or zipper freezer bag for longer storage. Put frozen scones directly in a hot oven at whatever temperature you normally bake them at, but increase the baking time. I don't see why it wouldn't work with this recipe, although they are a bit different from traditional scones in that the cream cheese replaces the butter. I do know that fully baked scones freeze and defrost beautifully, as do most baked goods--everything from cookies to breads. At our local coffee shop he adds poppy seeds to a similar recipe and then tops them with a fresh tomato slice and goat cheese before baking. Wow......best lunch ever! These scones are fantastic! Thanks so much for the recipe! Would it be okay to use cream cheese to replace butter in other scone recipes as well? Gourmet this month has a recipe for "homemade baking powder" to go in their biscuit recipe. Any idea what makes it better than store bought? The scones do look delicious, and I promise to try them with dinner one night, however what I've really been looking for is a "good" blueberry (fresh blueberry) scone recipe. I sure hope I'm doing this correctly, as this whole blog thingy is new to me! Anybody out there with a "to die for" blueberry scone recipe, feel free to drop me a line at tncarothers@aol.com! Thanks to all, forks up!!!! These look absolutely delicious. I knew looking through a farm themed food site would pay off. This is definitely a weekend cooking project. recipes look great! i was thinking of doing a wine jelly for christmas - any thoughts on a good scone to go with that? These scones are awesome! I made them for a bake sale at work and people loved them! However, I accidentally put in 1 tablespoon plus ONE teaspoon baking powder in the first batch (the batch for the bake sale). Last night I made a second batch and noticed the recipe actually calls for 1 tablespoon plus TWO teaspoons baking powder so I put that much in and they are a bit too salty. So I would recommend just 1 tablespoon plus 1 teaspoon b.p. Absolutely delicious recipe, however!!!!! These are amazing! So easy to make, so few ingredients, but so delicious. Thank you for sharing! I've looked at both recipes and they look great... will give them a try. We've always done our scones on a griddle and served them with butter and maple syrup. No... the recipe is a scone one not a griddle cake or pancake one! Oh my. I think I have all the ingredients for these in my fridge right this very minute! They may have to be made for dinner tonight. These were absolutely brilliant. I grew up on scones coming from a family with deep roots in the UK, but never cared for the sweet ones or rasins. This is the perfect recipe! Light and flaky and moist with amazing flavor. Next time I plan on upping the quality of the feta I buy (hope the local dairy has some at the farmer's market this week!). My 16 month old is inhaling these...I may not have any for tomorrow! I'm sorry for commenting on a years old post (guess I'm late to the party), but I am DYING to make these. Only thing is, I'm thrown by the 'no-butter' thing. Isn't butter integral to making flaky non-dense scones? Does the cream-cheese sub in here? Comments on older posts are always welcome. Butter is definitely not required when making scones - in fact, many 'cream scone' recipes call for only heavy cream, with no butter and often no eggs either. I made these scones today and they turned out fantastic !! I used grated aged cheddar cheese instead of the feta cheese. I loved the texture of the scones and am wondering if the secret with this recipe is adding the cream cheese instead of butter? Thank you so much for this site & I have saved it as I will definitely be back to try some of your other recipes. Oh Goodness me. These look amazing. Simply delectable. I can't wait to make these. I made these last weekend--first scones ever & they came out great! Must be the awesome recipe!!! 1) sift all dry ingredients together to ensure even distribution. cheese, I reduced the salt by half. 3) After the cream cheese was very soft, I mixed in the egg and gradually mixed in the milk. 4) I made a "well" in the center of the dry ingredients then added the liquid mixture. 6) I brushed the top with the egg glaze- This step is so worth it- gives a gorgeous color and keeps the top tender. When done, I cut the bread into "scone" wedges- PERFECT texture and flavor, but without all the kneading and none of the rough texture which can result from over working the dough and having to use too much flour. I hope this helps anyone making quick breads. Hi there, was just wondering if you sifted your flour and baking powder in your savory cheese scone recipe? Yay for cheese and scallions! I'm soooo making this one. Can't wait. Thanks for sharing. I made your scones last night, and they were absolutely delicious! Bet these scones taste just as amazing as they look. for my taste, using garlic herbed goat cheese, carmalized onions instead of scallions and added rosemary. They are delicious!!! Thank you for the recipe!! So glad you enjoyed the recipe - your version sounds great! And my three pots of rosemary on the kitchen windowsill that I brought in for the winter are (miraculously) thriving. I see some savory scones in my near future. :) Thanks for the mouthwatering inspiration. In your above reply of January 28, 2006, you mentioned that you have a similar recipe with cream cheese but without feta. I am looking for such a recipe where the cream cheese substitutes for the butter (or there is little butter) and no other cheese. Would you care to share your recipe or its source please? I make a cheddar and chive variation of this recipe (which I finally photographed last week and am actually hoping to post soon), where the finely shredded cheddar stands in for the feta, but this recipe will work fine without a second variety of cheese added in. Just follow the recipe above and simply leave out the feta. also i read in one of your earlier replies that most scone recipes dont even call for the use of eggs... coud you please do me a huge favor and add a few of your eggless variants of scones and other savory treats and desserts..
thanks a ton.... eagerly waiting for your reply! I'm so glad you're enjoying my recipes. I'm not sure about your oven - a convection oven with forced air isn't necessary (I never use one), but you do want the inside of the oven evenly heated. Even if you can't get the oven as hot as some recipes call for (such as 400 degrees F), you can still successfully bake lots of things at a lower temperature. Many people swear by cooking quick breads, etc. at just 325F rather than 375 that many recipes call for. I'm afraid I always put eggs in my scones (our hens are laying over a dozen a day right now! ), but a quick look on google or foodblogsearch.com should give you many scone recipes that don't call for eggs. In the Farmgirl Fare Recipe Index I do have some eggless baked goods, including beer bread, the yeast breads, pita bread, the blueberry breakfast bars and apple blueberry crumble bars, and the baby shortbread cookies with chocolate chips and toffee bits (which are still good if you can't find toffee bits). Hi, this recipe looks great! I have an excess of green onions at the moment and cant wait to try it out, but I was wondering do you think I could substitute whole grain flour or would it change the consistency of the scone and cause it to not bake right? Whole wheat flour definitely makes scones denser and heavier, but they can also be very delicious! I would recommend using white whole wheat flour (which is 100% whole grain, just a different variety of wheat that bakes up lighter) and starting with a 50/50 mix of white/whole wheat flour. If you like the results, try using more whole wheat flour.